Empowering Australian Cybersecurity through education, community and passion! #SECeduSum19 brings together the major cybersecurity educators and leaders in the profession from across Australia to discuss and share what it takes to build a secure digital future - how we can all more effectively produce much needed Australian cybersecurity professionals at scale, and how industry can partner with educators to provide rich real world educational experiences for students. Immerse yourself in a full day of exploration and engagement with Australia’s leading and most successful cyber-educators, major industry and government employers of cybersecurity professionals, alongside articulate students and graduates discussing and sharing practice that works, including mentoring and work integrated learning internships and placements. Industry leaders, domain experts, and key educators are brought together to tackle critical topics and discussion points on what and how to effectively teach cybersecurity – integrating technical skills, human skills, risk, leadership, privacy, innovation and the security engineering mindset. There will be breakout sessions, workshops and a series of keynotes from renowned cybersecurity leaders and education experts as well as reflections and insights from students, graduates and the major employers. Be Inspired and informed by world renowned keynote speakers, breakout stages, hands-on workshops and networking at UNSW’s world class Scientia Grand Hall venue. Hands-on speaker sessions with interactive experiments and demonstrations. Networking with professional experts vested in cybersecurity education. 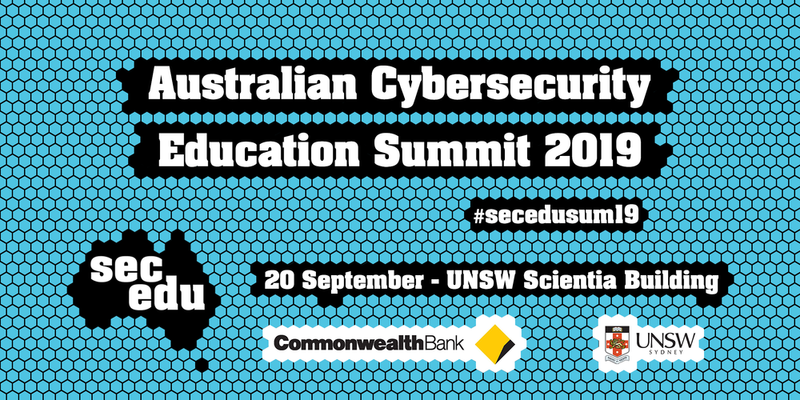 The conference is proudly sponsored by SECedu – UNSW’s Security Engineering Capability Institute which is a unique partnership between the University of New South Wales and the Commonwealth Bank working to support, grow and improve Australia’s cybersecurity education at scale and assist educators across the nation to effectively train Australia's next generation of cybersecurity professionals for industry, government, and innovation. Professor, Computer Security, Cybercrime, and Cyberterror UNSW Sydney. Click here for more information on speakers. More coming! Three different types of tickets are available - all tickets will have access to all day-time activities including keynotes, breakout sessions and breakfast/lunch. SECedu is committed to supporting students and teachers looking to learn more about cybersecurity education through discounted tickets. We’re excited to be hosting the official SECedu Networking Drinks, kicking off at 5PM in the Tyree Room and Alumni Terrace with canapés and drinks. With all of our keynote speakers and sponsors all together in a relaxed setting, this is a great opportunity to mingle with some of the most renowned experts in todays industry. Tickets to the Networking Reception can be bought in a bundle with Education and General Admission tickets only. Please specify any dietary requirements when prompted while confirming your ticket purchase. There will be photography and videography on the day, please specify when prompted while confirming your ticket purchase if you would not like any media of yourself published and released to the public. Limited onsite parking will be available. Street parking available around Kensington. Public transport also recommended.